The Bosch constant electronic system enables variable speed pre-selection. 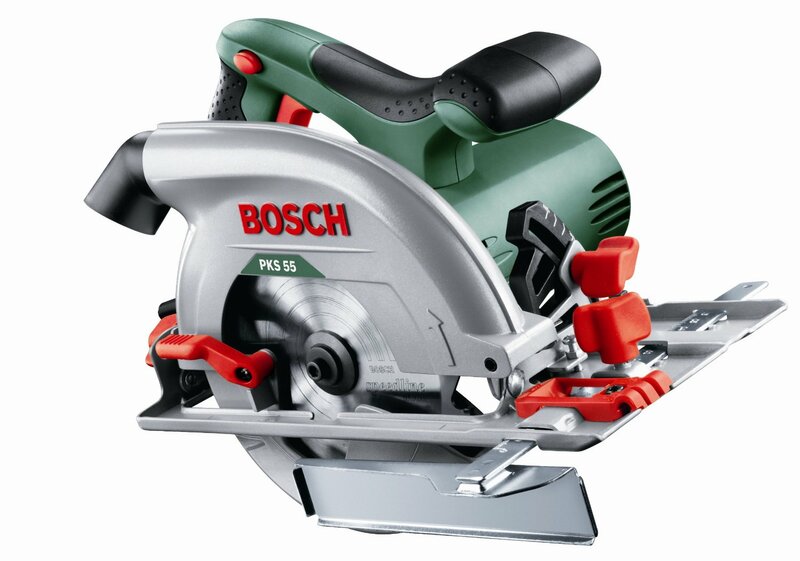 The Bosch PKS 55 Circular Saw is the ideal partner for accurate rip and mitre cuts. Saw hardwood and softwood, chipboard, but also MDF, Perspex and aluminium safely with the highest level of user comfort. The lock-on switch is a safety device which prevents the machine being switched on accidently. The tool can only be switched when the lock-on switch is pressed and held in place. The ergonomic design and softgrip ensure comfortable handling and perfect control in every cut. The functions are all easily accessible and easy to operate. The fold-out CutControl allows controlled freehand cuts. This and the clear base plate mark make it easy to track the marked cutting line and enable extreme precision. The integrated spindle lock allows for fast and easy saw blade changes. The tool is robust with a torsion-stiff construction with protective aluminium upper guard. A metal foot plate with groove also allows optimal and stable guiding of the saw.